The time has come for another GrappleThon, this year at a new venue. Dónal and I co-founded Artemis BJJ back in January: since then, we've been running classes at the central Bristol Sports Centre venue on Mondays and Wednesdays. Before and after we set up our club, we'd also been teaching at an unusual gym in Bitton (involving locked gates, llamas and Noel Edmonds. No, really), the old venue for local fitness gym Hit Fit. The owner, Mark, mentioned that he would be moving to a swish new location once the change of use was confirmed in late February. I decided to take a risk and arrange the GrappleThon to coincide with the opening of the new venue, so it could act as a sort of launch event. In February I started to get things in motion, setting the date as 12th April, because I was completely booked up the rest of March and April. That gamble didn't quite pay off, because once it got to April, it turned out that the venue was not going to be ready to officially open until May. Mark was kind enough to let us go in there early to stick with the advertised time, despite the fact that he and his team were super busy with preparations to get the gym ready. It’s an amazing charity with 22 volunteer counsellors that see up to three clients every week. 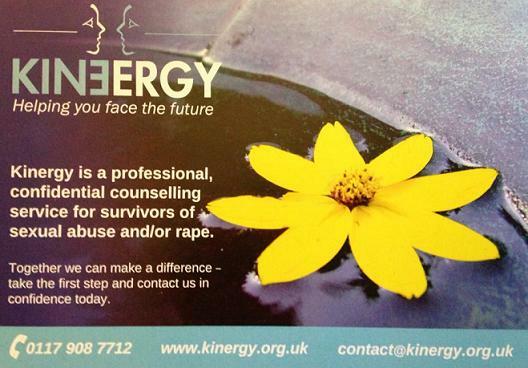 Kinergy offers a year’s free counselling and is open to everyone, regardless of location, age or gender. It’s hard to put into words how amazing it is at Kinergy. The waiting list is a year long: due to the lack of funding, Kinergy was forced to not take on any more referrals. It is hoping for more funding to support the service and create more referral opportunities. Some clients come to Kinergy trying to deal with the indescribable levels of abuse they have faced, attempting to express themselves and gain some sense of what happened. Kinergy can give clients the tools to support themselves in the future. The counselling can potentially be a huge step for a client. I have met many clients that feel they can’t speak out to get the support they need. Some abuse is hidden and spreading this message of support, even if it only reaches one survivor, could be life changing for that person. Just like every year, the support of Seymour 'Meerkatsu' Yang and Tatami Fightwear was absolutely invaluable. Seymour came up with another brilliant t-shirt and poster design, while Tatami generously printed the t-shirts for the third year running. 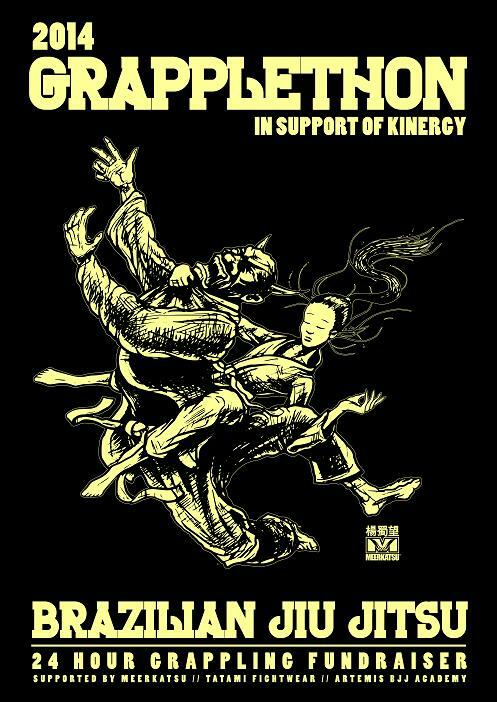 Seymour then went a step further and sold 10 prints of his beautiful 'Heavenly Wristlock' rashguard design, with the profits going to Kinergy. The aim was to raise £500: there was a slight shortfall of £40. Most people would have just shrugged and sent in the £460 (as after all that remains a considerable donation). Not Seymour. He filled the gap from his own pocket. Numerous people contacted me beforehand about bringing down teams from around the country. My response is always "the more the merrier": I love the way that GrappleThons can bring people in the BJJ community together, so we can all both make new friends and renew ties with old ones. 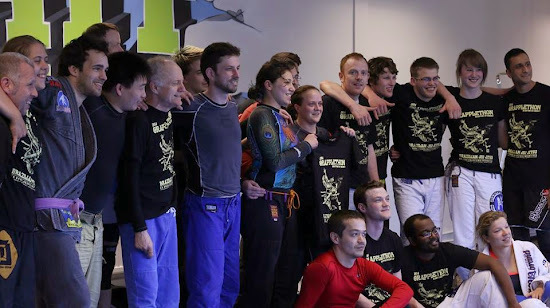 There were BJJers who headed down from Northern towns Congleton and Chesterfield, a Welsh contingent from over in Aberystwyth, plus a few teams from around London (like Horizon BJJ). A lot of grapplers were crazy enough to commit to the full 24 hours. Anne Birkett and her Westcoast BJJ crew were the largest group, with some impressive fundraising meaning that they all earned t-shirts, seeing off some stiff competition. Anne could be seen bouncing around the venue for the majority of the event (I especially enjoyed her 5am dance-off grapple with Paula) while Kris kept us all going in the quiet hours of the morning between around 2am and 7am. I don't think he stopped grappling over those five hours! There were lots of other female grapplers heading along for the first time. Rachel, the champion fundraiser for this event, not only drove all the way down from Chesterfield, this was her first time ever sparring outside of her club. She was only planning to spend a couple of hours originally, but impressively managed to at least double (triple?) that initial slot. Well done Rachel, on both fronts. As happens with any event you plan in advance, a few people unfortunately picked up injuries before the big day, but a number still turned up anyway to support. I certainly don't expect anyone with an injury to make it all the way down to Bristol, as it's totally fair enough if they stay at home to rest up and recover. That's what I would probably do myself (I'm a confirmed wimp). Hiren ignored his busted wrist to get in some grappling, Anne herself had messed up her neck, Geraldine was there with her bad back. David popped a rib so couldn't train (he still tried! ), but came along to help out anyway. For me, it was my first look at the new Hit Fit venue, in the process of being readied for its official opening next month. There is a decent mat space and - as of this weekend - two cool murals on the walls, painted while we watched by a skilled Slovakian artist. Rather less artistically, I went on an Instagram spree this year, something I hadn't started using by the date of the last GrappleThon. I set up a GrappleThon specific Instagram, so that's full of pictures from the day. I was using it to update on the hour, as well as try and make up for my rather limited pre-event directions...not that I wouldn't know where the venue was, that would be silly. Ahem. As usual, I'll also put down my sparring notes: I definitely rolled more this time than in the previous two years, though that still probably doesn't amount to more than four hours total over the whole 24hrs, maybe five. The usual themes from the last year or so keep cropping up. I'm still relying on the running escape way too much, rather than trying the basic guard recovery and turn to knees first. I'm also not yet managing to effectively combine with the stiff arm escape: I think I managed that once, but there was a reasonable weight discrepancy. Like Kev suggested with the running escape, I continue to look to control that far arm, but with higher level grapplers like Shane, their arms almost immediately snake past the elbow I'm trying to block by my hip. That messes up the escape, so it then becomes a battle of digging their arm back out. Marcelo does the hip swing escape to guard with the arm still in, like Jeff Rockwell showed me in Texas a couple of years ago (sort of, as part of another technique), but I have yet to do it successfully without clearing their arm. In guard, especially open guard, I'm getting passed too easily by anyone experienced, who tend to either leg-drag me or otherwise control my legs and slip around. I would have thought that is partially because I'm not threatening enough with sweeps, plus I'm also not doing a good job of combining attacks. I went for the windscreen wiper repeatedly without much luck (even if they were smaller than), possibly because my angle is poor and I'm telegraphing it too much. I tried Kev's grip break to back take or sit-up sweep (if they pull their arm back), but again not much luck there. 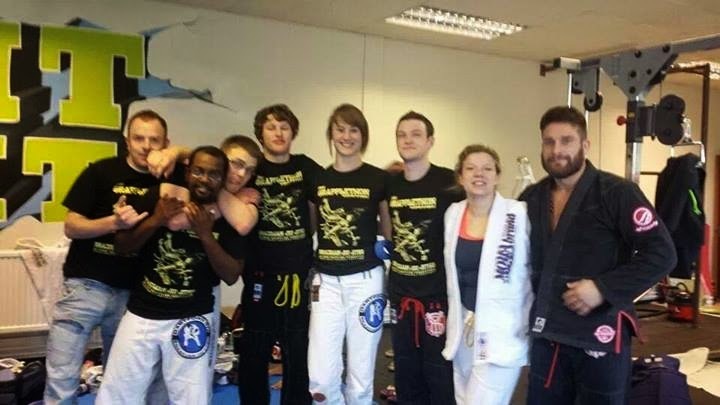 I'm looking forward to organising the 2015 GrappleThon at Artemis BJJ: I already have a date, venue and charity in mind, so will get planning that in a while. Probably early in the year again.